INCREASED connectivity and collaboration between the world’s wave and tidal power test sites is vital to ensure resources are used strategically and to help boost the development of international markets. That was the key message from delegates attending a major international marine energy conference held in Orkney last week. Plans to create an international research forum and global ocean energy network to drive progress in the sector will now be drawn up. The three-day Global Ocean Energy Symposium – part of a programme of events marking the tenth anniversary of the Orkney based European Marine Energy Centre (EMEC) – attracted wave and tidal experts from mainland Europe and as far afield as China, North America and Singapore. 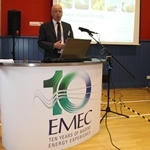 Neil Kermode, managing director of EMEC, said: “The symposium was an enormous success and gave marine energy test centre colleagues from around the world the opportunity to see first hand the pioneering wave and tidal power work taking place here in Orkney. 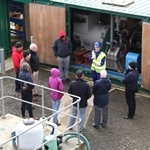 “It was a privilege, during our tenth anniversary year, to showcase EMEC’s world-leading facilities to our international colleagues,demonstrating to them how marine energy activity is having a positive economic impact in the islands, and indeed Scotland. We think that being able to point to the success of Orkney will help them accelerate their own programmes.Two thirds of the planet is covered in oceans, so harvesting this energy will be a multinational challenge, with Scotland in the thick of it. 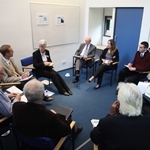 “We decided we wanted to build on the considerable momentum gained over the past decade through greater international collaboration and that’s why the symposium made a call for the creation of a formal global research forum for test centres. 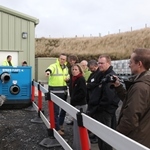 Twenty delegates attended last week’s symposium – hosted by EMEC and supported by Highlands and Islands Enterprise (HIE) and Orkney Islands Council. Speakers from EMEC were joined by experts from the Scottish Government, Marine Scotland, The Crown Estate, Northern Lighthouse Board and HIE. Topics covered at the event included government policy and support, infrastructure, licensing, standards and safety. 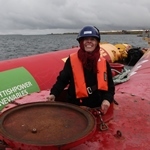 Amongst the international delegates was Dr Belinda Batten, director of the Northwest National Marine Renewable Energy Centre in Oregon, USA.